This year’s installment of the annually anticipated rivalry clash promises to deliver yet another spectacle of school spirit and high-quality hockey. The Crimson and the Big Red will clash for a third time this season when Harvard visits Cornell this Friday. The Harvard men’s hockey team defeated a formidable No. 6 Quinnipiac squad on Saturday in its most challenging bout so far this season. Yet, the in-conference victory, while important, may still fail to match the intensity of the Crimson’s upcoming trip: to Lynah Rink this Friday for an energetic battle with No. 15/14 Cornell. In a raucous atmosphere unlike anything Harvard’s Bright-Landry Hockey Center has to offer, Big Red supporters hurl cheers and fish alike down upon the Crimson icemen. This year’s installment of the annually anticipated rivalry clash promises to deliver yet another spectacle of school spirit and high-quality hockey. Cornell (9-5-1, 5-2-1 ECAC) enters the tilt having swept a ranked Arizona St. team last weekend. The Big Red has gone without a loss (4-0-1) in its previous five contests, cementing itself among the nation’s top clubs. Harvard (7-5-3, 4-4-2) will arrive in Ithaca, N.Y., fresh off its stingy defensive performance against Quinnipiac but with more mixed results prior to that, falling to Princeton and tying Boston University to round out last week’s three-game slate. The Crimson sits just outside the USCHO top 20 and can quite realistically crack the list with a victory at Cornell’s expense. Harvard has not been ranked since it dropped out of the polls in mid-November of 2017, before which it had remained in the top 20 for 78 straight weeks. Friday’s Ivy League affair also carries important conference implications. The Crimson, with its .500 conference record, sits sixth among the 12 ECAC teams and can vault the Big Red with a victory. Cornell has two games in-hand on Harvard, though, heading into Friday’s matchup with just eight ECAC games under its belt. The 110-year-old rivalry between the Ivy League foes is as strong as ever, with both teams competing for the ECAC and collegiate crowns nearly every year. The 2018-2019 campaign has given fans of the Crimson-Big Red rivalry a special treat: over Thanksgiving break, the teams met at the storied Madison Square Garden for the Frozen Apple, an additional non-conference battle. Harvard shone up and down the lineup in Manhattan, nabbing the squads’ first meeting. 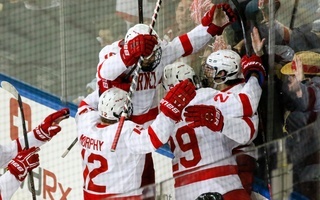 Just a week later, Cornell tripped to Cambridge looking to avenge its loss at the Garden. A pair of second-period goals guided the Big Red to victory. Friday’s showdown at Lynah will thus mark the third and final regular season game between the rivals. 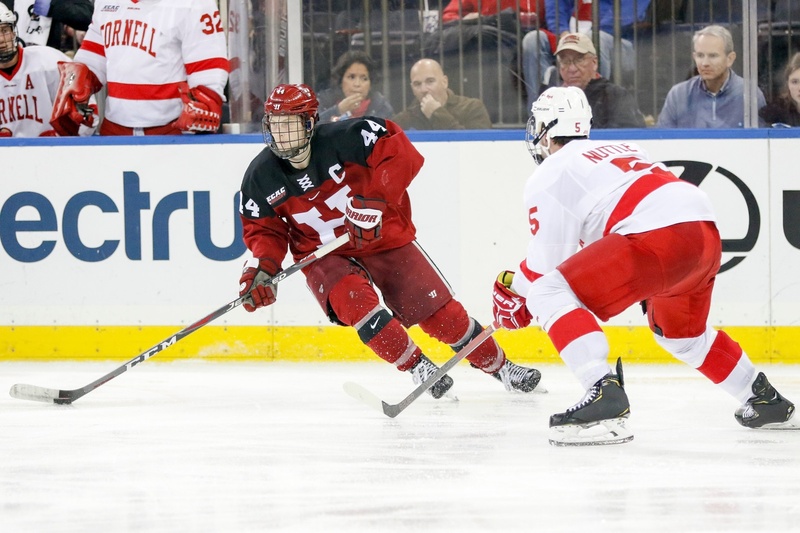 In both prior tilts this season, injuries sidelined multiple mainstays in the Cornell lineup. At the Frozen Apple, coach Mike Schafer was without the services of blue-liners Brendan Smith (9 GP, 1–1—2) and Alex Green (3 GP, 0–1—1) as well as forwards Jeff Mallott (10 GP, 1–1—2) and Brenden Locke (10 GP, 2–2—4), all four of which contribute nightly to the team. As their numbers reflect, however, health has hindered their consistency, both in terms of availability and production. The following week at the Bright, sophomore net-minder Matt Galajda, arguably the team’s most valuable player over the last two seasons, was sidelined. After starting in nine consecutive games to kick off the campaign, Galajda (6-4-0, 2.53 GAA, .891 SV%) missed five contests before returning to the blue paint last Saturday. Big Red net-minder Matt Galajda returned from injury last Saturday in a win over Arizona St. He will have to fight to regain his starting spot, however, due to Austin McGrath's solid play in his absence. In his absence, classmate Austin McGrath (3-1-1, 1.84 GAA, .932 SV%) has put forth stellar numbers, somewhat muddying the starting goaltender situation in Ithaca — this despite a decorated freshman season from Galajda. Regardless of who tends the cage for the Big Red, Harvard’s potent offense will present challenges for Cornell. While the Crimson has struggled to pot the puck after returning from the winter recess, ranking in the bottom third of the NCAA with 2.25 goals per game, its season-long average of 3.27 is good for 13th in the country. A large contributor to Harvard’s scoring success is its powerplay, which leads the nation at 35.7 percent effective. With the man-up unit averaging well over a goal per game (1.33), powerplay hockey is one of the pillars of this year’s Crimson squad. Each member of the first extra-man unit adds a unique element to the system. Most notably, the puck moves through junior defenseman Adam Fox (7–16—23), whose ability to slow the game down with the puck on his stick draws attention from penalty killers and allows him to capitalize on his knack for playmaking. Fox sits stop college hockey in powerplay points per game (0.87) and third in the league in overall points per game (1.53). On the wing, freshman Casey Dornbach (3–17—20) plays the role of set-up man, leading the NCAA in powerplay and overall assists per game (0.73 and 1.13, respectively). Fellow rookie Jack Drury (5–10—15) wins the majority of offensive-zone draws and creates traffic in front of the opposing goaltender. The Crimson powerplay, pictured here after scoring versus the Big Red at Madison Square Garden in November, leads the nation in execution rate (35.7%). At the point opposite Fox, sophomore blue-liner Reilly Walsh (5–9—14) has used his lethal point shot to score all five of his goals with the man advantage. Co-captain Lewis Zerter-Gossage (10–3—13) dwells in the high slot ready to unleash one-timers of his own or pick up loose pucks in front of the net. The second powerplay unit also pitches in, as it did in Saturday’s close victory over Quinnipiac, courtesy of Marino’s bomb from the point. 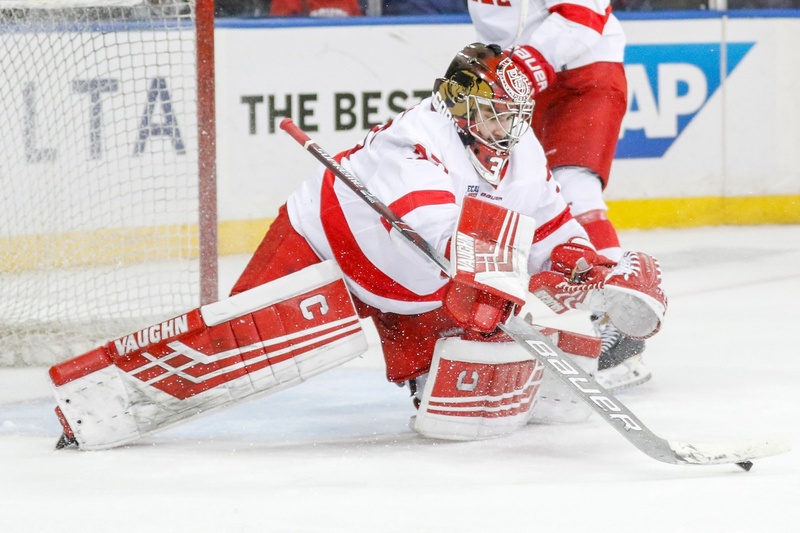 Even though Cornell has traditionally played a defense-first, goaltender-friendly style, Crimson backstop Michael Lackey (7-4-3, 2.32 GAA, .920 SV%) has also posted sturdy numbers. Especially of late, Lackey’s surge combined with a stronger commitment to team defense — initially a struggle for the squad — has changed the complexion of this year’s Harvard team. A 110-year-old rivalry, crucial conference points on the line, one of college hockey’s most electric barns, a stellar powerplay clashing with notoriously stingy team defense, and a deluge of fish — whatever the storyline, the annual Harvard-Cornell battle at Lynah Rink has something for everyone. This year’s matchup will offer it all.